Well this was a fun day! 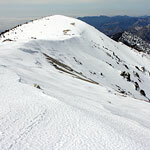 For today's ski agenda, I thought I'd climb up Mount Baldy, give the north face a look-see, ski a piece of it if feasible, then climb back up to the summit and drop one of the Baldy Bowl Chutes. Ordinarily when I'm feeling North Face aspirations, I like to start from the ski area and the Backbone trail, just to reduce the vertical load. But I decided to do the climb starting from the lowly Manker Flat trailhead. 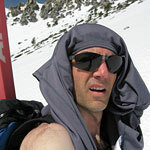 After all, I do have a list of big Sierra ambitions on my April agenda, and what better way is there to prepare for ultramarathon ski tours than to put a little extra hurt on the body? First of all, today was very warm. Forgot my favorite sun hat, so I improvised to try to keep my head from getting cooked. As for snow, it's no longer possible to ski below the Ski Hut. 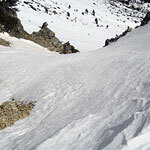 That said, the bowl itself was in terrific shape: smooth, consolidated corn, just fabulous spring conditions. And very warm—so get an early start. Any way you look at it, it's a long way up to the summit from Manker Flat. I left skins in the car and just cramponed up with skis on my back. This is definitely less efficient than skinning, but it's also faster. 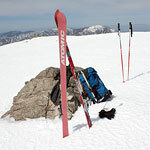 Atop Baldy I had a snack and then snapped into my skis for a northward look. 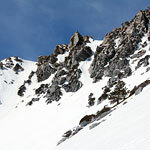 Baldy's north face can be pure, death-ride ice, so be very cautious if you're thinking about skiing it. Last winter, in fact, the NF never softened (as far as I know) and remained unskiable all through Spring. Today the north face was hardly offering good skiing, but it was viable at least. Kind of a windboardy crusty mess with just enough bite to get a decent edge into the snow. Given that the north face is...well, north facing, I did dig a quick pit. Interesting stuff: about 12" of slab on top of maybe 3-4 feet of unconsolidated (but fine-grained), sugary snow. I did get some alarmingly clean shears when I pounded on a few columns, but I couldn't get any indication of propogation beyond. I would have expected a denser snow pack after all the warm temps we've been having, but where snowpack is concerned, Baldy's north face always seems to exist in its own separate universe. Treat it with care. 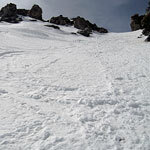 I skied about 500 vertical feet down the middle of the face—which was plenty. Climbing out meant post-holing all the way back to the summit, and that more than satisfied my desire to get a workout. One final note just in case it's not obvious: if you keep going down here, you're not coming home...unless you think you can swim the San Gabriel River through the most remote part of the San Gabriel Mountains. It felt good to be back on top of the mountain. In contrast to the north aspects, the upper south face was just primo skiing: smooth, velvety snow that invited big GS turns and even bigger smiles. I traversed past the Girly Man Chute (which looked completely burnt: 55° and thin coverage) and Hourglass, and decided to ski Dostie's Dare, which looked reasonable (the name, I believe, comes from former Couloir Mag publisher and anti-government radical Craig Dostie). Dostie's Dare was just good clean fun. Steep but not scary, on good slushy corn. Like all of the Baldy Bowl chutes, the Dare is a short but sweet line that manages to feel a whole lot bigger when you drop in for a visit. It was now a little late in the day for the best skiing, but the open bowl down to the Ski Hut still offered a great descent. I just love that sensation of blasting over velvety spring corn snow. Sublime! The walk from the hut down to Manker flat was painful—literally. 2000' vertical feet is a long way to hike down in my megarides, which are about one half shell size too small for me. Great for skiing, but not so good for pounding the trail. I think I'll bring a set of hiking boots for the lower section next time, and just carry my boots. That's it for the report. Try to get on top of the ridge by 10:30 a.m. tomorrow for the best skiing in the Bowl. 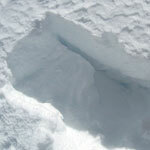 As for the north face, it would be wise to wait a little more for things to soften and consolidate.